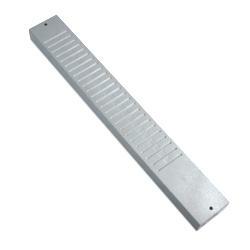 The ETR 75 electronic clocking in machine is one of the best and reliable clocking in machines on the market. Not only can it provide you with a suitable time solution for recording the attendance of your workforce, it is also ideal if you’re looking to save time and money too. As with any of our high-quality clocking in machines and time recorders, the ETR 75 electronic clocking in system is your go-to time recorder for your time and attendance needs. 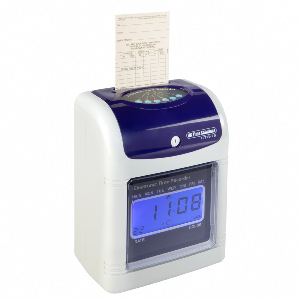 Here at UK Time Solutions, our clocking in machines are used to accurately measure the number of hours worked by your employees, and will help with payroll preparation which needs to be accurate if employees are to be paid according to the hours they work! 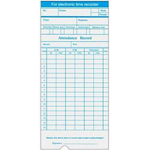 With the ETR 75 electronic clocking in machine, you will also receive the time cards and time card rack to hold the time cards safely. As well as this, we provide you with 12 months warranty to ensure you’re covered if anything should happens to the clocking machine. When it comes to keeping track of time, you want to make sure that you have a suitable clocking in machine that provides you with the best value for money. You can count on UK Time Solutions to provide you with exceptional value for money by providing you with an efficient clocking in machine, like the ETR75! 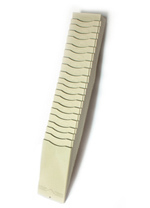 To find out more about our clocking in machines, get in touch with us now! Traditional 7-day weekly time card. Automatic programmable IN - OUT selection. The machine can be programmed to stamp red to highlight lateness. Accurate timekeeping by quality quartz time base. Fully automatic time reset in case of power failures. Automatic summer/winter GMT and BST time changes. Clear easy to read LED time display. 1-year warranty for parts and labour.